So you have just finished painting your apartment, or perhaps just your room or your kitchen. It has been a very challenging experience, an enormously gratifying one – as you have probably not done a painting job all by yourself before or you have just a little experience with it (even some professional painters end up with some of these mistakes). After taking your time to do your very best on the ceilings and walls of your home, you then take a couple of steps back to admire the great work that you have done. You step back only to see a couple of issues with your painting job such as dried drips, a bit of bubbling, significant brush marks, and stains. After spending so much time and putting in so much effort and resources into painting the walls of your home, it can be very disappointing to come across these painting mistakes on your just painted walls. Everyone is bound to make mistakes, even the best painters in the world sometimes experience these mistakes during and after painting. So you shouldn’t be so disappointed when you come face to face with such issues on your just painted walls. Rather, what you should do is to look for a solution to the problem. What you need to do when you encounter such mistakes. How do you go about it and what do you need to get rid of such mistakes? These mistakes are absolutely correctable, as there are certain things you can do to make them right. Some people have quite a very funny way of covering such mistakes when they come across them. Some of them tend to move a piece of furniture to cover them, or they just hang a picture over it. But when you encounter such mistakes on your walls, you can fix them by doing the right things, the right way. This article is here to guide you on how to fix some of the most common mistakes people make when painting their homes. Whether you’ve made such painting mistakes before or not, you are going to find this article very useful, as you might encounter some of these mistakes in the future. 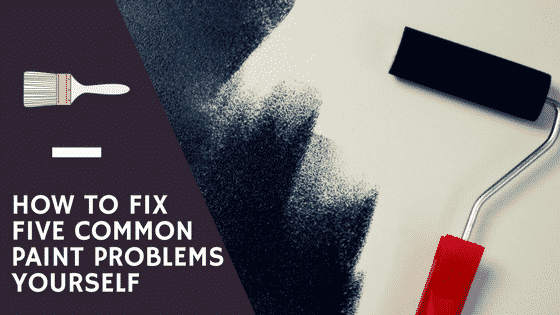 So read on to find out how to fix common paint problems yourself. Here are five common paint problems you can fix yourself. This mistake can be avoided during painting. To avoid this mistake, you need to ensure that your painting brush is not overloaded with paint while you are painting. But mistakes can happen no matter how careful you might be. So if you end up making this mistake and find drips on your wall, here are some simple steps to help you correct the mistake. • Use a scraper to scrape the paint drips on the wall carefully. Make sure you focus on the area alone and scrape it gently. • Sand the area you just scraped until it becomes very smooth. • And then repaint the sanded area. • Use a machine sander to sand the area with brush marks. You have to be careful when doing this, so it doesn’t affect other areas. • After sanding the area, paint the area again. Finding stains on your just painted walls can be very annoying and painful. In as much you try to avoid this, there is still a possibility that you’ll find stains on your walls. The possibility of stains showing up on your painting job is even much higher when you don’t prime properly before painting. A stain on a wall (especially just painted walls) is something you find very difficult to ignore. Fortunately, there are ways you can take care of this problem. Getting rid of stains on the wall is not a difficult task, and here are some steps to help you get rid of those stains on your wall. • Clean the stained area thoroughly with TSP. • Allow the area you just cleaned to dry completely. • When the place is dry, an oil-based undercoat should be applied over the stain. • Allow the undercoat to dry completely, and then repaint the area. Flaking paint usually occurs over a period of time as moisture gathers under the surface of your paint. But this can also be experienced when paint is applied to a surface that is damp. Luckily, this problem is fixable, and it only requires the following few steps to fix it. • Remove the flaking paint with a wire brush or paint scraper. • Make sure the edges between the scraped and painted areas are smooth. • Paint the area again. The kitchen and bathroom are common places to find mildew. But this problem can be taken care of by following these steps. • Put on protective clothing, gloves, and eye-wears, use TSP, bleach, water, and a stiff brush to wash the affected area. • Wash from bottom to top in order not to stain the surface. • Allow the wall to dry for about 48 hours. • Use a mildew protection primer to prime the area. • Use two coats of paint to repaint the area.